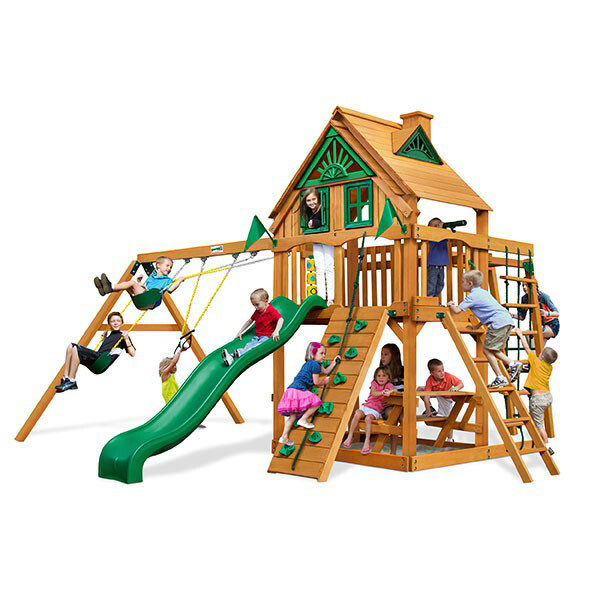 Everyone in the neighborhood will want in on the action when you have the Gorilla Playsets Mountaineer Clubhouse Treehouse in your backyard. 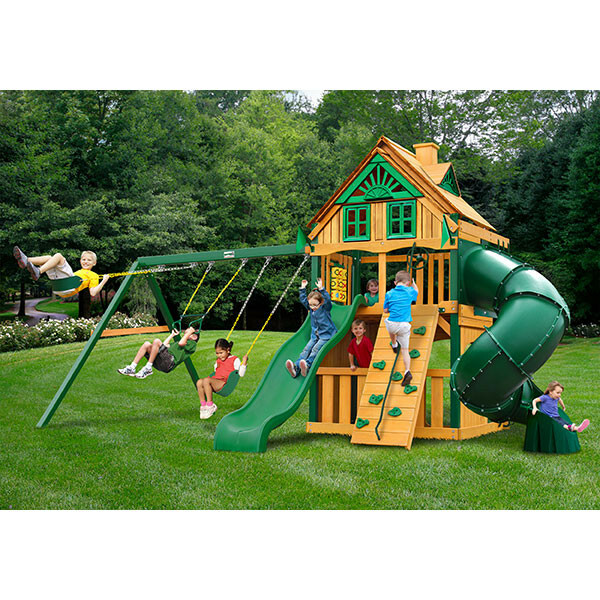 This fun playset has it all starting with a treehouse above and a semi-enclosed clubhouse below. The clubhouse is equipped with a large window, an arched entry way, and a half-wall enclosing the entire lower level. Above, the treehouse features a wood roof with a cool sunburst design, windows, and shutters that really work. Just like all of the best swing sets, the Mountaineer Clubhouse Treehouse has a variety of climbing and swinging features including two belt swings, a trapeze swing, rock wall and climbing rope ladder. 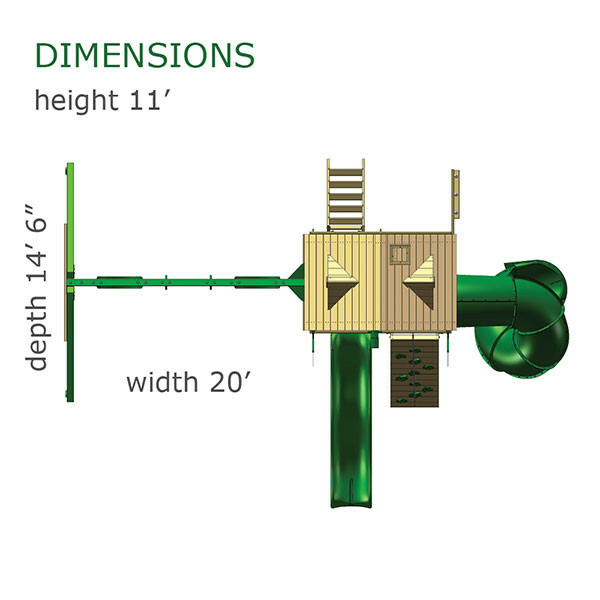 The wave slide and Extreme Tube Slide double the sliding fun. And for some extra added adventure the upper platform includes a tic-tac-toe panel, steering wheel, and telescope. 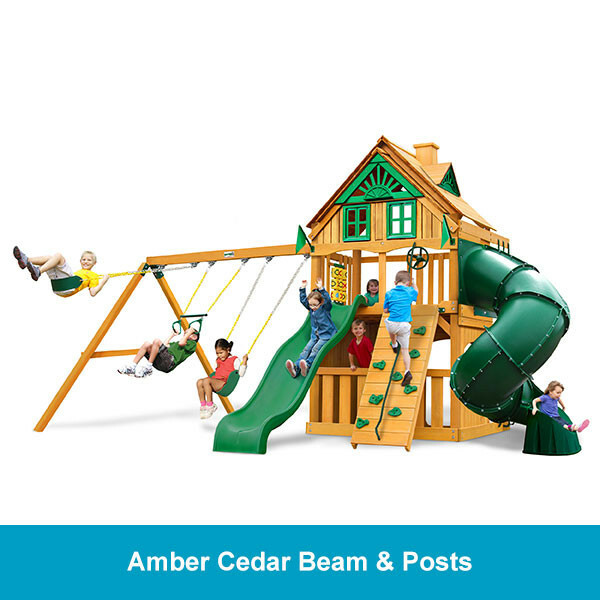 When you order this high-quality swing set, you’ll get to choose between the green Timber Shield beams and posts or the matching cedar finish posts and beams. Everything you need for do-it-yourself assembly is part of the package, including the necessary hardware as well as pre-cut, pre-sanded, and pre-stained lumber. This already amazing Gorilla playset comes with the option for a Fort Add-On. When you choose this addition your swing set will not only have a great wood roof with windows and working shutters, but the main play deck will be enclosed as well. The fort option is a great choice for the most imaginative kids who will love playing and hanging out with their friends in their enclosed fort.